Satellite Girl and Milk Cow is the animated feature from Chan Hyung-yun, previously known for the animated shorts A Coffee Vending Machine and Its Sword (2007) (available on this release) and Wolf Daddy (2005). An out-of-commission satellite that was sent into space to take images of the Korean peninsula picks up the signal of a down-on-his luck and café performing musician. Longing to hear more of his beautiful song, the satellite comes down to Earth, but she gets caught up in a magical battle that has engulfed the planet and she is transformed into the Satellite Girl, Yoo Ah-in. Meanwhile, the singer she wanted to meet has also been transformed – into a farm animal, a milk cow, as all people with broken hearts on Earth have been transforming into farm animals. Now, Satellite Girl and Milk Cow find themselves thrown together with the wizard Merlin — who himself has been transformed into a roll of toilet paper – and battling dark forces taking over. One such force is an incinerator burning up all the transformed broken-hearted lovers into ash and the other is a hunter trying to steal Milk Cow’s liver. These two unlikely allies find something unexpected in their dangerous adventures – friendship and maybe even love. Satellite Girl and Milk Cow is an unusual adventure that is reminiscent of the sort of quirky anime features that Hosoda Mamoru (The Boy and the Beast, The Girl who Leapt Through Time) creates. Both owe a great to the visual and storytelling style Miyazaki Hayao (Ponyo, Howl’s Moving Castle), but both have gone in their own directions. Chan may not be quite as strong in his ability to see the story through or make all the disparate elements of his fantasy make sense on an emotional level, but this film is still very charming. Chan does effectively grow the character of the Satellite Girl gradually from cold, calculating, overwhelmingly curious, to normal girl with human-like emotions, jealousies and eccentricities; these make the evolving relationship between the protagonists very believable and heartfelt. From a visual perspective, Satellite Girl and Milk Cow is visual eye candy and about what one would expect from this sort of family friendly “anime” feature film at this point. Although the quality on this Blu-ray disc is middling (see below), the animation, artwork, and character designs are beyond reproach. From the oddball talking toilet paper to the appealing, goofy yet lovable look of Milk Cow, everything adds up to a visual treat and one that kids and older animation fans will love. 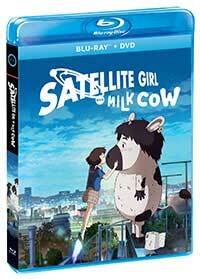 The digital, hand drawn animation for Satellite Girl and Milk Cow comes to Blu-ray in an AVC 1080p encodement from GKIDS and Shout! Factory. The colors look well saturated and detail is fine, but there is a lot of compression noise and scanlines are clearly visible in the animation fills, so this isn’t the cleanest looking animated feature film I have seen on Blu-ray. Satellite Girl and Milk Cow comes to Blu-ray with the original Korean-language audio in a DTS-HD Master Audio 5.1 mix that is nicely balanced, has clear dialogue, and a good amount of dynamic range with full low frequencies and solid effects panned through the surround channels. The English dub, that has a cast that also puts in a very worthy performance, also gets a DTS-HD Master Audio 5.1 mix that sounds identical to the Korean mix. The supplements on this release aren’t many, but the half-hour animated short Coffee Vending Machine and Its Sword about a vending machine who can briefly turn into a human that meets an eccentric young woman is a real treat to watch. A heartfelt anime film that has some minor flaws, but ultimately provides a pleasing story about love in unexpected places against the backdrop of a supernatural battle of the good vs. evil. A funny, wholesome adventure. A decommissioned satellite falls to Earth so it can find the singer of a song that its radio antennae picked up from space and gets caught up in a magical battle that changes it into a 'satellite girl'. She then finds her brokenhearted singer transformed into a milk cow. who is being chased by a mystical organ thief who wants his liver. The two battle against dark forces while also finding love in an unexpected place. This Korean animated feature from director Chang Hyung-yun bares striking resemblance to the anime features of Miyazaki, and, although it isn't as well structured is a charming, heartfelt, and wholesome adventure for the whole family.